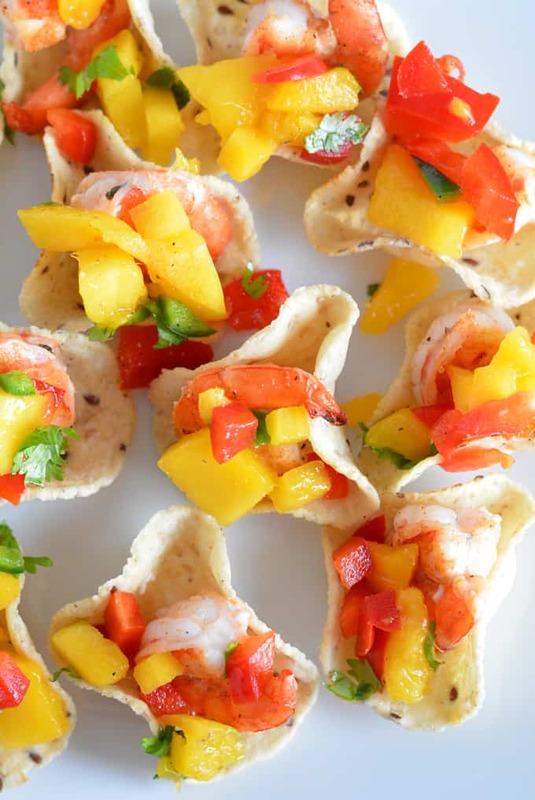 Get ready for Summer with these mini shrimp tacos topped with mango salsa. It’s one week before Memorial Day weekend. For many it’s considered the official start to Summer. For our family, it really does mean the start of Summer. It’s the first weekend that we go back to the beach. It’s also the first weekend that we get to see our Summer friends again, many of whom we have not seen since Labor Day weekend. 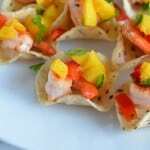 When I received this month’s Recipe Redux theme I instantly thought of shrimp tacos. Last summer I was complete obsessed with shrimp tacos and mango salsa. I can’t count how many time I made them. The Recipe Redux is a monthly recipe challenge. Participants create healthier recipes each month centered around a certain theme. This month’s challenge is Small Plates. I love shrimp. I always have a bag of frozen raw shrimp in the freezer. I prefer raw verse fully cooked because I like to cook shrimp myself. Cooking shrimp myself allows me to use different seasonings. Shrimp cook’s fast, so are great for a quick meal. This appetizer only takes a few minutes to make. You can cook the shrimp ahead of time if you are batch cooking or doing your prep ahead of time for your party or event. 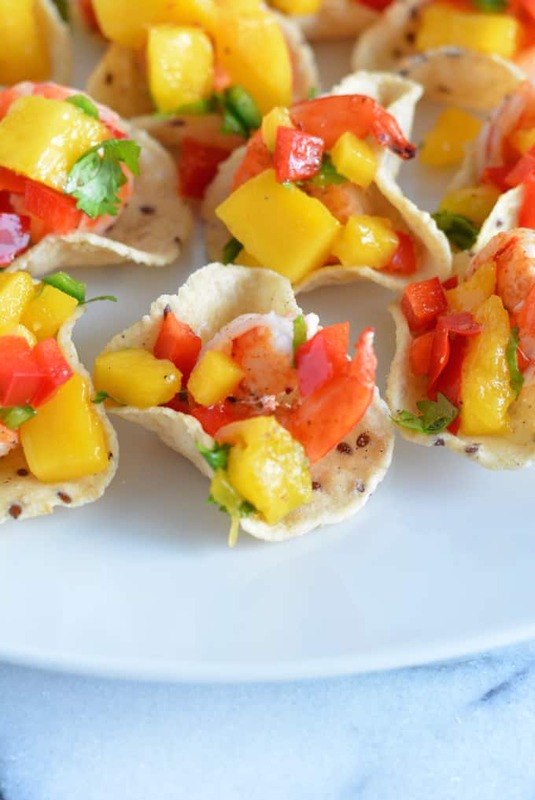 The mango salsa only has 6 ingredients. The salsa is easy to make and can be prepared ahead of time. The recipe here does make more salsa than you need for twelve shrimp tacos. 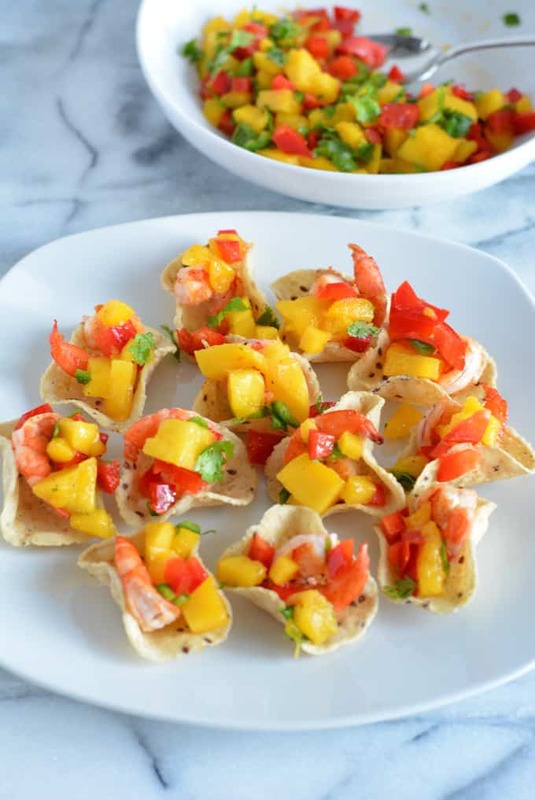 The mango salsa can be refrigerated and saved for 1-2 days. You can use the extra for more shrimp tacos or use as a topping for chicken or fish. You will also have some red bell pepper left over. Don’t let this veggie go to waste! Bell peppers are a great source of Vitamin C. Cut the unused pepper into strips and use for snacking, salads, or stir fry. I think tortilla scoops are one of the best food creations. There are the perfect snack size and the perfect shape to hold other ingredients. I buy Wegmans store brand of scoops rather than traditional Tostito Scoops. The bag is bigger and cheaper plus the scoops themselves are bigger and sturdier. They’re less fragile, so easier to fill up. Despite being a bit bigger then Tostito’s they still don’t hold a lot. I only fit in one shrimp per chip. If you use smaller shrimp you may be able to fit in two. These are appetizers, so one shrimp per scoop is really all you need. In a medium bowl combine shrimp, salt, pepper, and cumin. Toss to coat shrimp with seasoning. In a medium skillet heat olive oil over medium heat. Add shrimp to skillet, cook turning until shrimp turn pink. Remove shrimp from skillet and set aside. 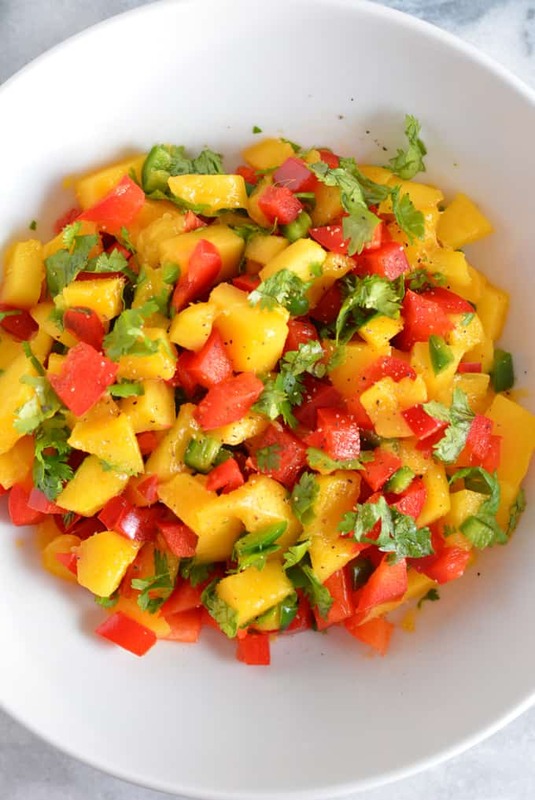 In another bowl combine mango, red bell pepper, jalapeno pepper, cilantro, lime juice, and black pepper. Toss ingredient together to mix well. 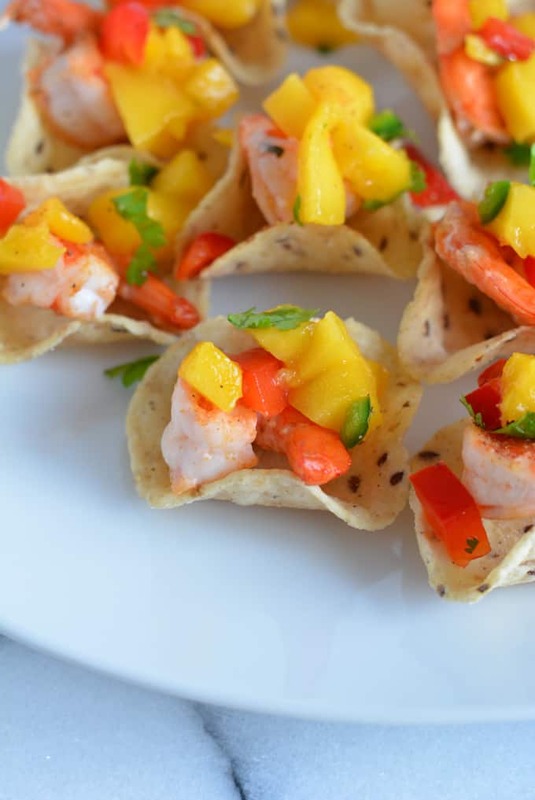 To assemble; place one shrimp into each tortilla scoop, top with mango salsa. 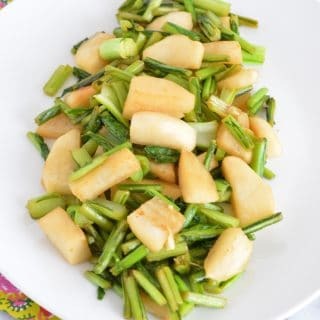 Do you have a favorite Summer food? Let me know in the comments. 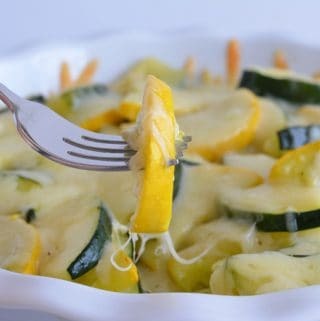 Looking for more small bite recipes? Check out my bite size Pinterest Board. Don’t forget to see what I am eating! Follow me on Instagram and of course, if you make these mini shrimp tacos share a picture on Instagram and tag with #nourishedsimply. This looks so fresh and tasty! I too always keep a bag of shrimp in the freezer — love how quick they cook up. Will definitely have to try this! These look so fresh tasting! I bet the mini shrimp I usually buy would be perfect for these! Oh Jen – I love love these! So colorful and appetizing yet simple to make – pinning! I love small plates! I’m allergic to shrimp – do you think I could substitute white fish? I think you could substitute any fish! I enjoyed the leftover mango salsa on turkey and salmon.